Enemy of the people. It’s a phrase that’s we’ve heard lobbed time and again at the press by the orange man in the White House, so much so that The New York Times even wrote a story about the phenomenon and its obvious connection to Ibsen’s 1882 play of the same name. Unsurprisingly, it’s been programmed with increasing frequency in the last two years, speaking directly to contemporary concerns about the truth, corruption in government and the precarious position of the whistleblower. 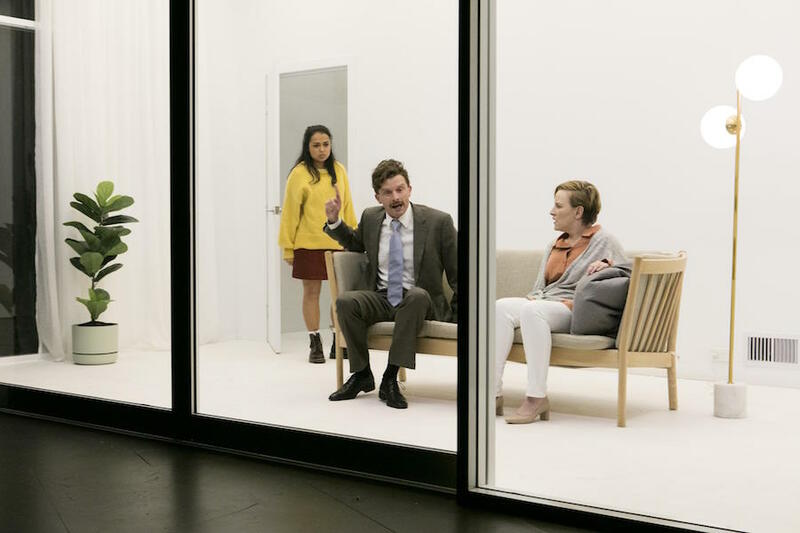 In Melissa Reeves’ adaptation for Belvoir, Dr Thomas Stockmann has become Dr Katherine Stockman, mixing the treatment of women into an already heady cocktail of social behaviour under the microscope. Reeves’ effective retelling is set bang in the moment, rife with contemporary allusions that never feel heavy handed but serve to underline the play’s urgency. We’re transported to a small country town in Australia, where Katherine, a wellness consultant, has discovered that the baths on which the community’s prosperity depends are tainted and causing illness. It’s a project that she and her brother Peter, the town’s mayor, have helped bring to life. Unsurprisingly, Peter is adamant that she bury the truth, her proposed solutions eye-wateringly expensive and a PR disaster for his campaign for re-election. But Katherine sticks to her guns, even when she loses the support of the local newspaper and an association of small business owners, supposedly representing the ordinary people. One of the most fertile sources of tension in Ibsen’s play is the flawed nature of his protagonist. Not unsusceptible to vanity or self-interest, his creation feels particularly familiar to us today, another strength of this modern updating – as Katherine soon demonstrates, whistleblowers aren’t inherently perfect people. Atypically for Ibsen, the women in Enemy aren’t as well conceived as the men, which is what makes Reeves’ adaptation so rich. 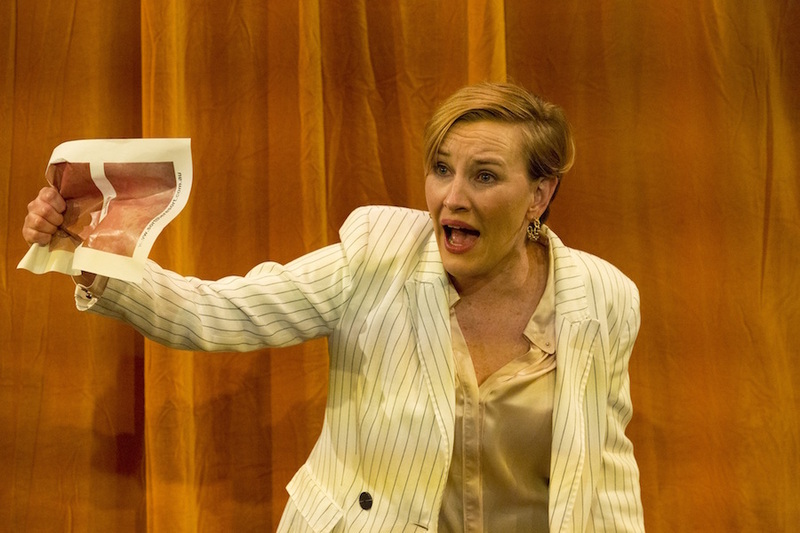 Katherine, in a note-perfect performance by Kate Mulvany, is fully realised and complex – she can be self-regarding and self-righteous, but she is also compassionate and principled, a contradiction that’s absolutely true to human nature. It’s this fascinating collision of impulses that drives the play’s most potent chapters. Just as the audience thinks it’s found itself a hero, Katherine blasts the townspeople, describing them as an unthinking, junk food eating mass wedded to their phones and contributing nothing to society. That’s not to mention her denunciation of liberal democracy, or the way in which she readily raids the personal life of her cleaner for details that will score her political points at the town meeting. She also has major blindspots when it comes to class and race. In Anne-Louise Sarks’ lucid production, this betrayal of audience expectations registers even more strongly given that all this is addressed directly to us, the audience having been roped in as the townspeople. If there is one criticism to be made here, it’s that this crucial meeting lacks the dangerous quality that a bigger cast could bring, and I’m not sure whether a more responsive audience could provide the feverish mob mentality of Ibsen’s original. 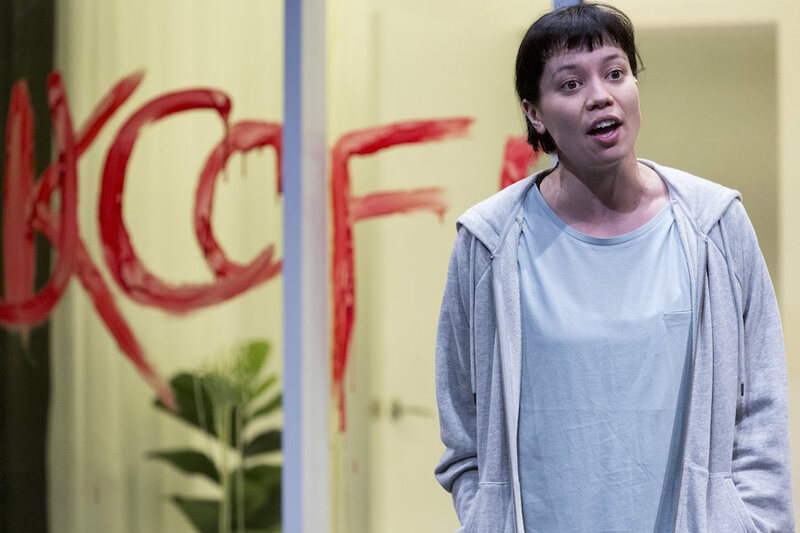 On opening night, the attempt to whip up response from the audience didn’t have the desired effect, with the violence directed at Katherine and her daughter Petra (an effective Nikita Waldron) mostly told rather than shown. That said, there is still plenty of abhorrent male behaviour on display, with Peter (Leon Ford), Chair of the Small Business Owners’ Association, Aslaksen (Kenneth Moraleda), and journalists Hovstad (Steve Le Marquand) and Billing (Charles Wu) a foul chorus of bullies. They lurk, they interrupt and they shout at Katherine, behaviour intensely familiar to any woman and immediately summoning up Alan Jones’ loathsome and recent attack on Louise Herron. The cherry on top is how quickly their blustering condescension tips into explicit misogyny, with Billings’ jeer of “shut your legs” shocking in its abruptness but ultimately true to life. Similarly realistic is the threatening graffiti scrawled across Katherine’s glass doors, a violent slash of red on Mel Page’s cleverly conceived set, and the intimate, cruel ways in which Katherine’s father in law, Morten (Peter Carroll, making the most of his limited stage time) tries to coerce her into backing down, threatening the economic security of Petra. The cast make for a tight ensemble, anchored by Mulvany’s terrifically nuanced performance. One of the play’s most gripping passages is the early confrontation between Katherine and Peter, both actors going hell for leather in defence of their respective characters’ beliefs and interests. In keeping with Reeves’ increased focus on Ibsen’s female characters, the cleaner of the Stockman household, Randine, is a significant presence in this adaptation (in Ibsen’s original, she’s an unnamed, offstage maid). Though some of her concluding speech is overwritten, Catherine Davies’ performance is wonderfully subtle and gives voice to the working class people that Katherine initially purports to represent. With Petra, these women form a kind of alliance at play’s end. Their future might not be rosy, but their careful optimism is nonetheless supremely galvanising. This is a show that speaks directly to our troubled, complex times.